Dionysius created his last great work here, at the little monastery church at Ferapontovo, dedicated to Marys birth. He told the essential story over the main entrance using soft colors drawn from nature. It begins with Marys mother Anna lying in expectation and ends with Anna tenderly embracing the new born Mary. The story is on the outside; but the glory lies within. See the feature article about Ferapontovo in the June/July 1998 issue of Russian Life. 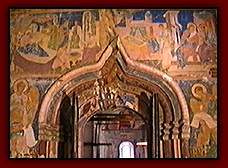 Here, in an amazing short period of 32 days in the late summer of 1502, he painted the entire interior of this church with a glorious set of frescoes, at a time of great trouble for Russia, because the Church calendar had run out in 1492 and many people were expecting the end of the world. But to Dionysius, the end of the world was not the end of everything; there was a heaven beyond, another existence in which the saintly figures seemed to float into space. 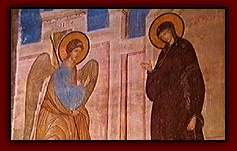 Gabriels visitation to Mary seems to lead us into the ethereal world of music itself.